Like most beans, black beans are available dried and from a can. You might be tempted to choose canned black beans because they are convenient and quick. Not only are dried beans less expensive than canned, but they are also measurably more delicious after they're cooked. Turning a rock-hard little nugget into a silky, satisfying stew, however, does take some effort, and, most of all, time. Plan ahead and use these tips to make a great pot of beans. Once you taste them, you might never go back to the canned variety. Pre-soaking black beans significantly reduce cooking time and improve their texture. First, rinse the beans to remove any surface dirt. Then place them in a colander and pick through the beans to be sure there are no small twigs or stones that might break a tooth or be otherwise unappetizing. There are two soaking methods: Overnight and quick-soak. Overnight method: Place the beans in a large enough container to allow for expansion and cover with two inches of water. Let the beans sit overnight. Before cooking the next day, drain the beans, transfer to a pot and cover with fresh water. Quick-soak method: Place the beans in a large pot and cover with water; bring to a boil and continue to boil for two minutes. Remove from the heat and let sit for two hours. Drain, transfer to a pot, cover with fresh water and continue cooking. The quick-soak method might cause your beans to break-up when cooking. Use the overnight method for dishes where it is essential the beans stay whole, such as in salads and salsas. 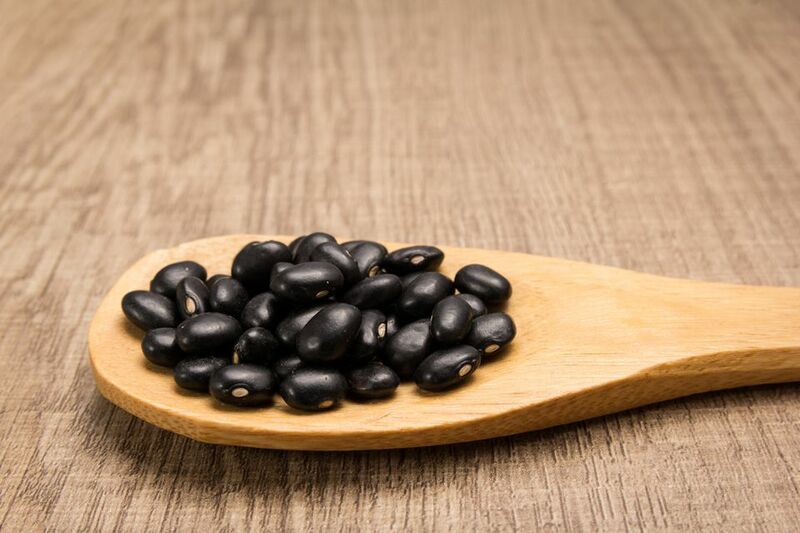 If it is hot in your kitchen, refrigerate black beans while they soak to prevent fermentation. To cook the beans, bring to a boil, then reduce the heat and keep them at a low simmer, covered, for roughly two hours. Stir them from time to prevent them from sticking to the pot. Older beans could take longer. Fresher dried beans will have retained more moisture and cook in less time. It is not always easy to tell by looking, so you'll have to sample a bean or two during cooking to see if they're done. If additional water is needed during the cooking process, use boiling water rather than cold water. During the cooking process, do not add salt or acidic ingredients such as lemon, vinegar, wine, or tomatoes until the beans are nearly done. Adding them earlier can change the texture of the beans and make them tough. Many cultures have traditionally included herbs that combat flatulence that is often a result of eating beans. Among them are summer savory and epazote. Add them at the end of the cooking time if desired. Once the beans are fully cooked, add them to your favorite recipes or simply season them with a little salt and olive oil and enjoy them in their purest state.